Our Cambridge programme will be used to augment the New Zealand Curriculum by providing structure and content which is consistent, coherent and purposeful. This will occur within a wider curriculum framework which acknowledges and values. In summary, our Cambridge programme allows us to combine the best of both worlds. Our senior school (Year 7 and Year 8) has a long standing reputation for excellence. Available data has indicated that our students have consistently achieved the highest average entry scores in secondary placement tests, achieve outstanding placements in their respective secondary schools, and continue to achieve well in these schools. By all reasonable measures, and across a range of fields, our seniors have been well served by a rich curriculum, dedicated teachers, and by the many benefits that go with being in a full primary school. 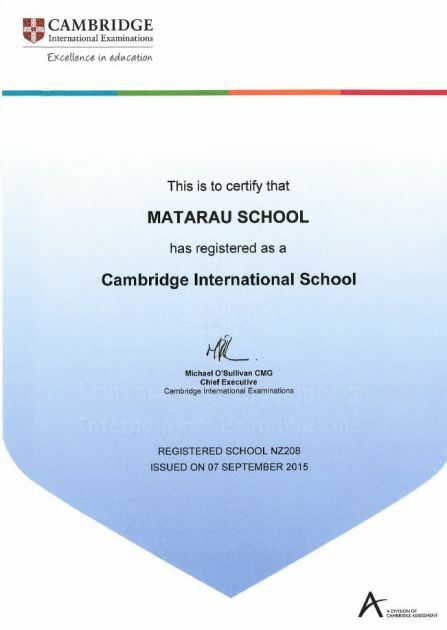 In 2016, for the first time, Matarau School offered the Cambridge Secondary 1 Programme in our senior school. This enabled us to make the world renowned Cambridge English and Mathematics Programmes an option for our senior students (and possibly the science programme from 2017). This was especially good news for parents contemplating Cambridge as an option at secondary school, for those considering private schools for their child (at some stage), and for those keen to give their child a very thorough academic preparation for year 9. Our Secondary 1 programme will take students to within one year of the international Secondary 1 checkpoint exam. Our seniors have the opportunity to undertake this programme of study (in full or in part) without private school fees. One of the many advantages of the Cambridge programme is its flexibility. It readily aligns with many of the programmes currently offered at Matarau School, and within the Personalised Learning Framework we are currently unfolding school wide. Children, parents and previous teachers are invited to have input into placement decisions, so that we all agree on the most appropriate pathway for each child. Currently the Cambridge options only affect the provision of the core areas of Mathematics and English, (and later possibly science). All other learning is delivered within the broader curriculum framework mentioned above. Where a child is not considered likely to benefit from the full Cambridge Programme, their programme is modified accordingly. The NZ Curriculum and the Cambridge Programme have been carefully mapped onto each other to ensure there are no gaps. Social Studies, Technology, Physical Education, Art, Music, ICT and Outdoor Education are integrated within the Cambridge Programme where possible ,or taught as they are traditionally taught. Children learn in different ways, and have unique talents and needs. It is crucial to match learners to the optimal pathway for them. Where possible, students are given authentic opportunities to develop their potential as self-directed learners. They set goals, develop plans, think critically and make their own choices along the way. We are excited at the potential of the Cambridge Secondary 1 Programme to even better prepare our students for success at secondary school and beyond, irrespective of whether or not they enter a Cambridge Programme at Year 9. We researched thoroughly before making this decision, and we are determined to implement Cambridge in ways which enhance the learning of every child, irrespective of their ability or learning style. Our commitment is to create a solid base in English and Mathematics, as a foundation for success in the other learning areas, and to create learners who are able to manage their time, set goals and make good learning and personal choices. Please don’t hesitate to contact us should you wish to discuss what this exciting programme has to offer your child during these critical years of their schooling. Cambridge International Examinations is part of the University of Cambridge. We prepare school students for life, helping them develop an informed curiosity and a lasting passion for learning. Our international qualifications are recognised by the world’s best universities and employers, giving students better options in their education and career. As a not-for-profit organisation, we devote our resources to delivering high-quality educational programmes that can unlock learners’ potential. Students will exit their homeroom programmes into the appropriate Cambridge pathway each day. They will then return to their homeroom for other subjects. Programmes will be taught by experienced teachers with specialties in the areas concerned. Non-Cambridge Maths and English but incorporating useful elements of the Cambridge Lower Secondary Programme. Children learn in different ways, and have unique talents and needs. It is crucial to match learners to the optimal pathway for them. When making these decisions consideration will be give to the following. Past achievement (and potential) in the subject(s) concerned. Commitment to academic learning including application to homework. Personal learning style. Extra-curricular demands on time. Familial circumstances and commitment. The lessons are structured really well. We go over things so that they get drummed into your head, but it’s also fun. Cambridge has helped me become more confident in maths. I know that I can do it when I focus. I was nervous about Cambridge to start with until I knew I could do it. I really like Cambridge because I’ve learnt a lot of new things and it’s challenging me. Also it’s really fun. It makes me work harder and always try my best and I am more confident in maths and English. I thought algebra would be really hard, but it is really easy to understand. What I like most about Cambridge is that you learn lots of things and it puts your brain to work. Cambridge is a bit harder but this has helped me. When I go to class I know I’ll learn new things and challenge myself. I didn’t think I would remember so many things but I can. Cambridge is not that different to last year but I enjoy it. I like the new techniques I am learning which are definitely helping the way I think about things. Every time I go to class I know what is expected of me and I am writing more in writing. I like Cambridge because it is getting me ready for high school. It is challenging me to learn new things and giving me more confidence to sit tests. It is also helping me to remember things better. I like Cambridge because I learn new strategies and techniques. It has made me feel more confident in maths because I have learned so much. I didn’t think I would be able to do such high quality maths. Cambridge pushes you out of your comfort zone and I really enjoy it. I have gone up a level where I am learning new things. Reading, writing and maths are more fun. I like Cambridge because it challenges me more. It is harder and more structured. I get extra help when I need it. I feel more confident and I can do things on my own. I love absolutely everything about Cambridge. I have lots more confidence in algebra and lots more. I now understand how to work out areas of things and even the pi thingy. We are delighted that the school has introduced the Cambridge Programme. Our daughter is thoroughly enjoying the programme and showing a positive attitude towards school. Her learning has improved immensely, expanding her skills and attitude towards life. Cambridge examinations are recognised all around the world and we are privilege to have the opportunity for our children to attend the programme at Matarau School. Credits earned through the Cambridge course is accepted throughout the universities around the world. This means, that the students with Cambridge credits can go to well-known universities in the Ivy League or in England. Because Cambridge is harder and more challenging than NCEA, students who have studied Cambridge can get high grades in NCEA. University study is easier for who has taken the Cambridge curriculum as it is more advanced than NCEA and covers the fundamental ideas before going to university. The Cambridge Programme has a great in-depth grasp on the necessary basics. I believe these basics create the foundations for future learning. Cambridge also creates much needed study skills which students can apply throughout their education. It is not only the content of the curriculum that makes it successful, there is also effective delivery. Regarding the Cambridge program for years 7 and 8 at Matarau. Still early days with this program but it seems to be heading in the right direction. The tremendous amount of work put in by the program’s teachers is evident, and the teacher parent sessions are of great value to parents who are getting used to the change in workload for the students. The fact that students are having to work harder to stay up to speed with the program can only be a good thing. Some students who are used to gaining good marks are having to adjust to lower scores (at this stage) however this has been explained at the parent/teacher sessions and is no longer a cause for alarm, especially from the student’s perspective. Testing to determine what a student doesn’t know, provides focus for both teacher and student going forward. We look forward to the students measurable development over these coming months.